Leave it to tOSU to bring me out of my late-winter slumber. What happened? You remember tOSU players acting up right around Christmas? Well, according to Yahoo! Sports [full article here], Tressel knew all about it long before he said he did. According to a source, a concerned party reached out to Tressel last April, alerting the coach that memorabilia transactions had taken place between Rife and a handful of Buckeyes players, including Pryor. The selling of items violates NCAA eligibility rules. The source said Tressel was troubled by the information, and the coach indicated that he would investigate the matter and take appropriate action. Whether the coach initiated an investigation of the accusation is unclear, but all five players remained on the field in the coming months, playing out the 2010 regular season. If Tressel failed to inform Smith or the Ohio State compliance department about the players’ dealings with Rife, he could be charged with multiple NCAA violations including unethical conduct, failure to monitor and a failure to promote an atmosphere of compliance. In general, a coach is required to act on, or pass along reasonable information about possible rule violations for further investigation. Ohio State itself could be cited with playing ineligible players and forced to vacate its 2010 season, when it won a share of the Big Ten championship and finished 12-1. It could also face further sanctions for major infractions. Smith was adamant at the Dec. 23 news conference that no one at Ohio State knew of the situation until the U.S. Attorney contacted them in early December. “The athletic department was informed on Dec. 8,” Smith said. I would note that the word "sources" appears many times in this article. That's usually a red flag when it comes to rumors about a coaching search, as we all know. But given that Dan Wetzel has staked his reputation on this, I am giving this story it's due attention. No question, this certainly doesn't bode well for Tressel. The article cites Tressel's contract, and notes that tOSU would be well within their right to fire Sir Teflon for cause. If it comes to that point, maybe Tressel falling on his own grenade will be all that can shield tOSU from the full brunt of the NCAA's hammer...and even then, probably not. Even if it comes out that Tressel was complicit (which it probably will), there's no way Ohio State will fire him. Ohio State hates Michigan TOO MUCH to can the one guy who can consistently beat Michigan since Woody Hayes. What would be sweet is if the NCAA takes away Ohio State's 2002 National Championship. Regardless, all this says about Ohio State is that they don't care about anything except winning. Morals? Screw that. Developing character? Screw that. Integrity? Hell naw. Ohio State's number one priority is beating Michigan, and if that means that some of the key players do misdeeds off the field, Tressel and Gene Smith are more than happy to look the other way. 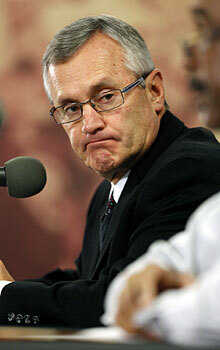 Don't expect Ohio State to seriously reprimand Tressel, let alone fire him. And expect the players to be just fine as well. Ohio State won't do anything to upset the chance to beat Michigan. It's all they have. Sour grapes backstabbers are all over the place, jumping on Tressel-all with absolutely no proof but an unfounded, unproven rumor started by an "anonymous source". This is all hogwash, and is nothing but an cowardly, feeble attempt to assassinate a fine, ethical coach who lives for his players welfare-and is pretty tought to beat. Just consider the jealousy motive behing those who would try to take down Tressel and tOSU!-maybe the like of the many crooks and semi-pros of the SEC?-or revengeful USC crooked backers? Nice take Jack. But as SI.com's Stewart Mendel writes..."Mind you, we're only about three yards into one of Tressel's patented 17-play field goal drives in terms of learning his ultimate fate." A lot of rumors about punishment will be thrown out there. We'll just have to wait and see what happens next. I expect a tOSU press conference sometime before the end of week. Really not shocked that there is more coming out with this situation involving tOSU players. Pryor, Herron, and Posey played huge roles in this tOSU team, and it is looking more and more like Tressel was doing everything he could to not put his team in jeopardy of competing for titles. If this comes out, tOSU may have no choice but to let Tress go in order to save some face for the University. This situation is so dumb. They sold their own stuff, who cares? That's a typical DUMB OSU comment! It's not about stuff! It's about Coach T. covering up and not abiding by the RULES that everyone else has to. If he cared about his players, like he said he did, he would have done the right thing last April! And now he got caught! So who really wins? Guess we'll find out when the NCAA makes their ruling on this matter! Yes, the "SACREDBROTHERHOOD" that sells their school's memorabilia for some foldin' money. "THE Ohio State Buckeyes face and overcome any adversity that comes our way!" Why, it's as easy as simply looking in the mirror! !